How do you know which room divider is right for your facility? If you are looking to turn your space into smaller semi-private spaces and you want to cut distractions and sound, room dividers are the perfect solution! FREEstanding and portable room dividers are easy to move and quick to set up. Pull open the storage latch, expand your divider to create your partition. You’ll love how your room dividers will make your space neater, more attractive and more intimate. Functional and practical, your newly divided room. More privacy, fewer distractions! This office space is shared by several employees. Noise and other distractions were starting to cut productivity. One 7′-4″ high by 20′-5″ long room divider is used to separate this space. Pictured, the divider is partly opened to create a wall. This divider can double in size and bent into the shape of an “L”. Pretty Nails Salon makes a massage room with room dividers. 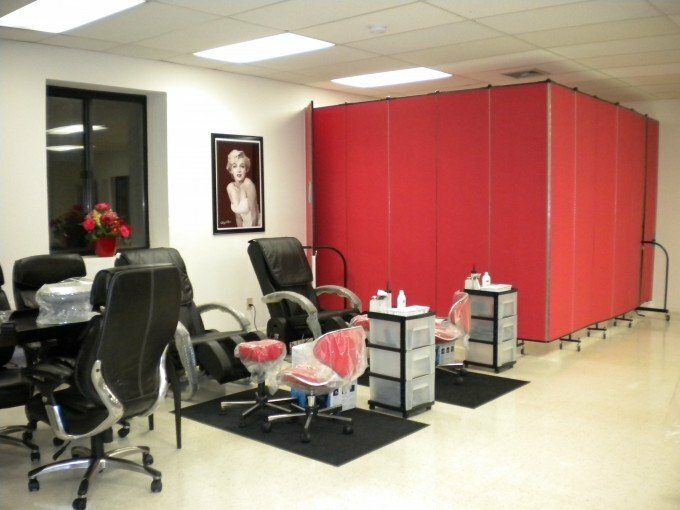 Pretty Nails Salon offers a variety of spa options including manicure, pedicure, facials and a massage. In order to offer a private massage area, one 6′-8″, 11-panel room divider creates a stunning room for spa services. Pretty Nails also added our door option. The red fabric complements this room! 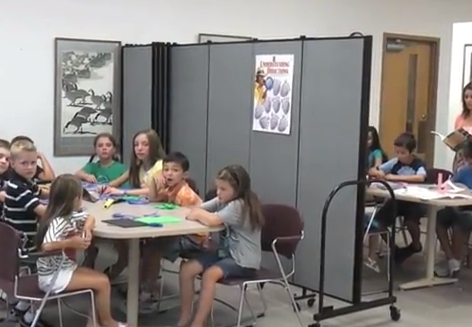 One Classroom Divided by Room Dividers creates two spaces for two different activities. This classroom was full of noise and distractions. While one group enjoyed a little free time, the other tried to read a book. 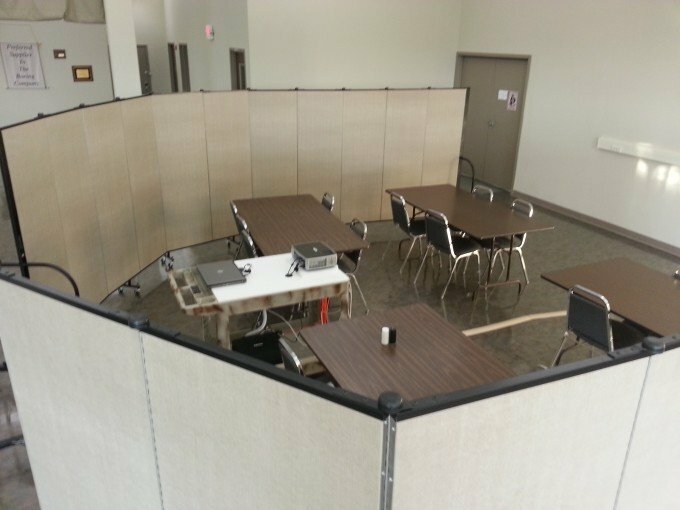 One 6′ room divider divides this class in half to cut unwanted distractions from the other group. Teachers love room dividers to give divisions in the classroom for other reasons such as test taking or to create a quiet spot for reading. One room divider creates a wall to partition off a luncheon. 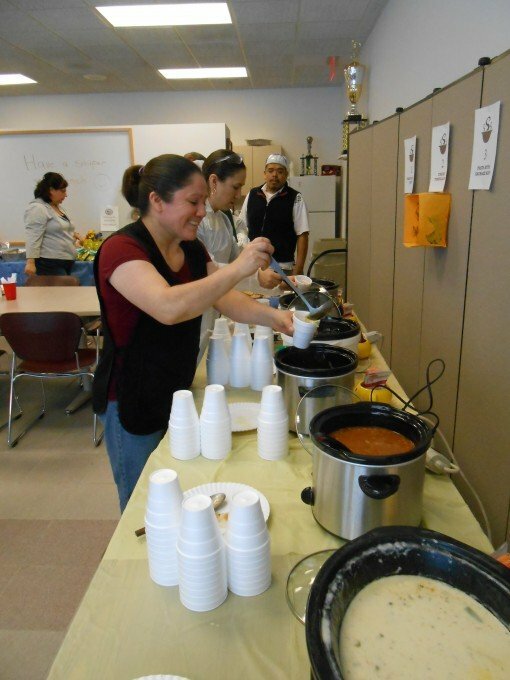 This room divider acts as backdrop and partition for a soup off/luncheon. One room divider can partition off two areas! In this case, a luncheon on one side and work on the other. Room Divider panels can also absorb up to 65% of sound. Panels are also tackable, pinnable, and except staples or velcro. High Traffic Areas? Need Privacy? No problem! Customers often ask how they can build a private room for a meetings or training but they want something temporary that they can use as they need to. These room dividers are flexible and can adjust to your room. Create a larger meeting space or smaller one. Create any shape to suit your space. Regardless of what your reason is for dividing space, Screenflex has a room divider for you. 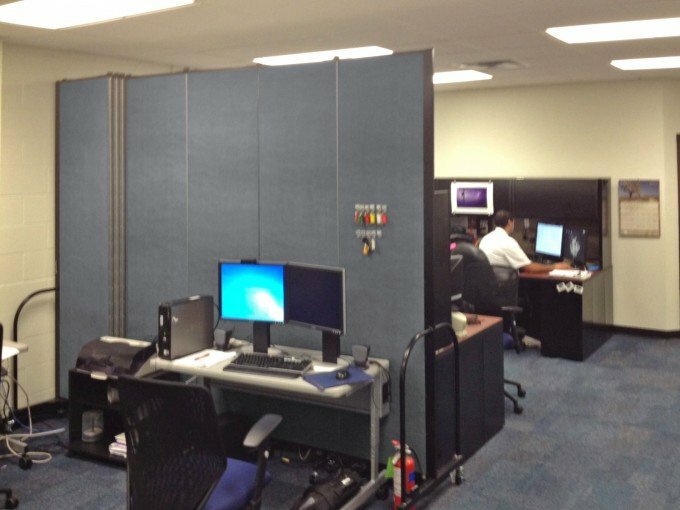 Create low walls, high walls, a long string of dividers or a shorter string of dividers; Screenflex can accommodate your space. Room Divider Options, What Do I Need?